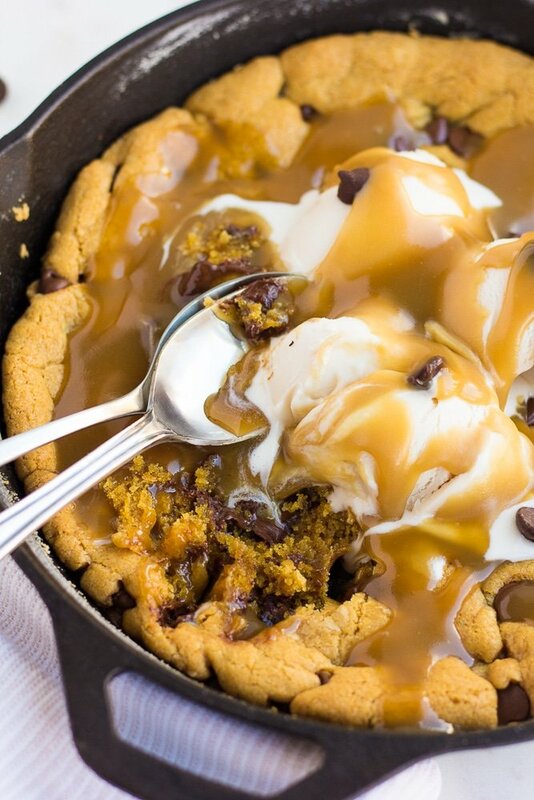 Vegan Salted Caramel Skillet Cookie, or a “Pizookie”, is a soft, giant, ooey-gooey chocolate chip cookie made in a cast iron pan and topped with non-dairy vanilla ice cream and vegan caramel sauce. 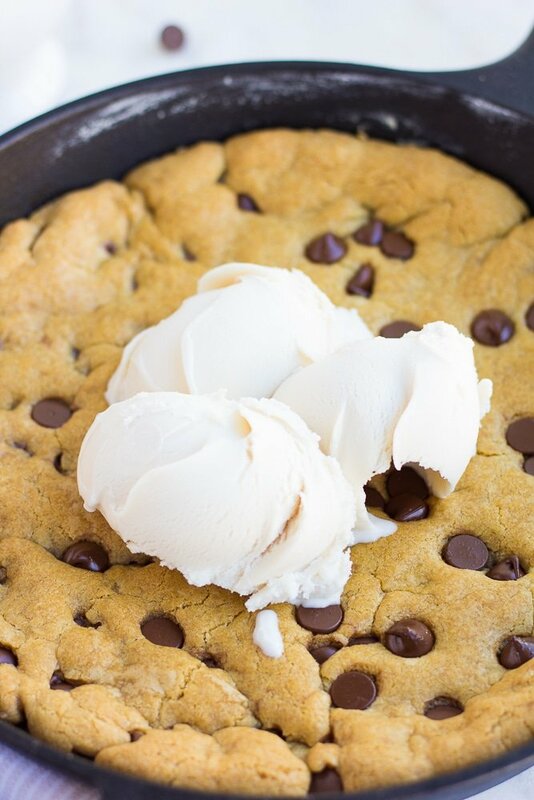 Are you familiar with “Pizookies”? We have a restaurant in town that serves them, and I’m always insanely jealous of the salted caramel one. I’ve been meaning to create my own vegan version at home for some time, and I finally got around to it! 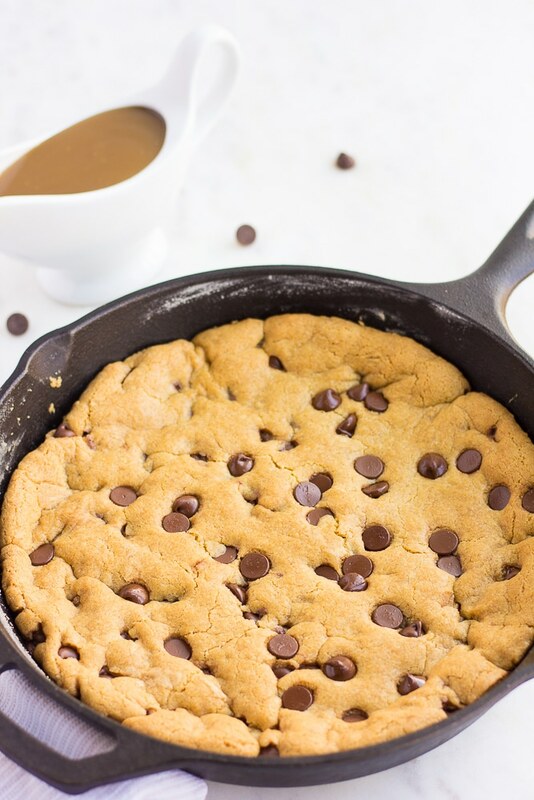 You will LOVE this Vegan Salted Caramel Skillet Cookie. It’s such an easy dessert to whip up! It’s made totally in the skillet, with no bowls required. The ingredients are simple, and it’s hard to mess up. If you have kids, they will love you for this! There’s something about a giant cookie that makes a child’s eyes light up. First, get out your 10 or 12 inch cast iron skillet. If you don’t have one, I highly recommend getting one! They have many benefits, such as being chemical free, they last forever, they add iron to your food and you can use them in the oven or on the stovetop. They also make a great tofu press! Preheat oven to 350 degrees. Melt the vegan butter/coconut oil in the skillet, then remove from heat and stir in the brown sugar. Then stir in the non-dairy milk and vanilla, and mix well. Stir in the flour, cornstarch, baking soda and salt, then fold in the chocolate chips. Press evenly into the pan. Bake for 15-20 minutes, until the edges are golden brown. It will still be slightly gooey in the middle, which it should be. 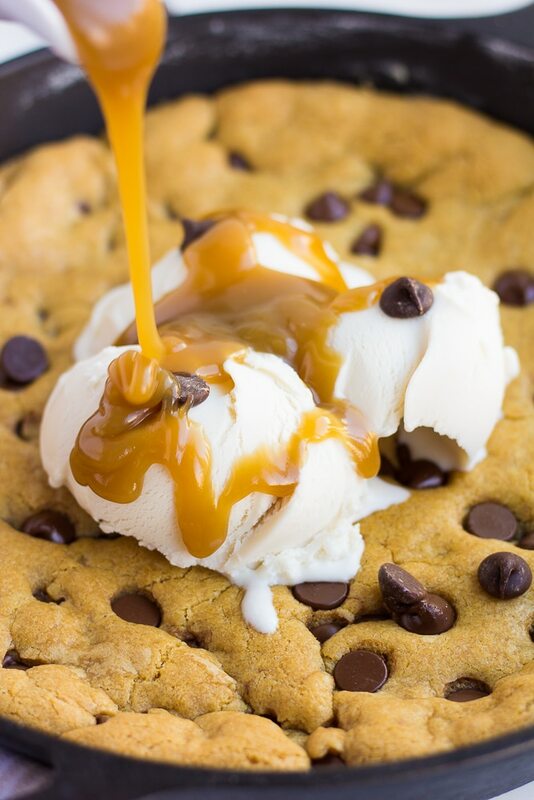 Serve immediately with non-dairy vanilla ice cream, 3 Ingredient Caramel Sauce, more chocolate chips and a sprinkle of salt, if desired. My family usually gathers around it, still hot, each with a spoon and digs in! You can also eat it in a more civilized fashion, buy cutting out a slice, then topping each slice with ice cream, caramel, etc. 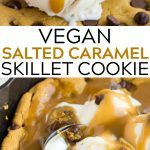 For the 3 Ingredient Vegan Caramel Sauce, make as directed and add a good pinch of salt for salted caramel. 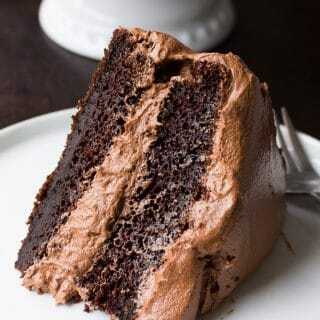 Taste until you are satisfied. 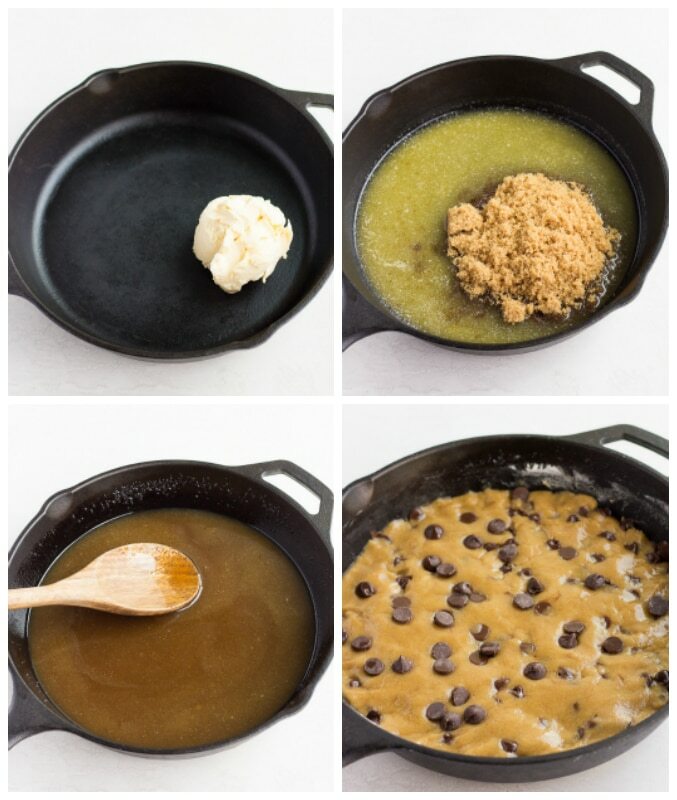 You can also leave out the caramel if you want a simple chocolate chip skillet cookie. 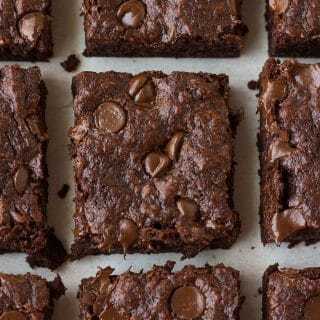 Want more irresistible vegan dessert recipes? 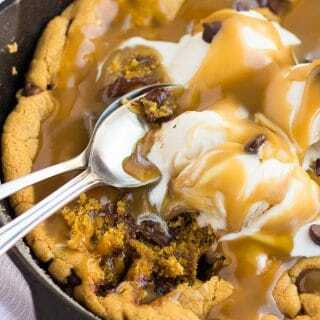 Vegan Salted Caramel Skillet Cookie, or a "Pizookie", is a soft, giant, ooey-gooey chocolate chip cookie made in a cast iron pan and topped with non-dairy vanilla ice cream and vegan caramel sauce. In a 10 or 12 inch cast iron pan, melt the vegan butter or coconut oil. Once it's melted, remove from heat and add the brown sugar. Stir well to combine, then add the vanilla and non-dairy milk, and mix until well combined. Stir in the flour, cornstarch, baking soda and salt. Stir in the chocolate chips, and press evenly into the pan with your hands. Bake for 15-20 minutes until the edges are golden brown. The inside middle will still be slightly gooey, which is how it should be. Serve immediately with non-dairy vanilla ice cream, salted caramel sauce, more chocolate chips and a sprinkle of salt, if desired. 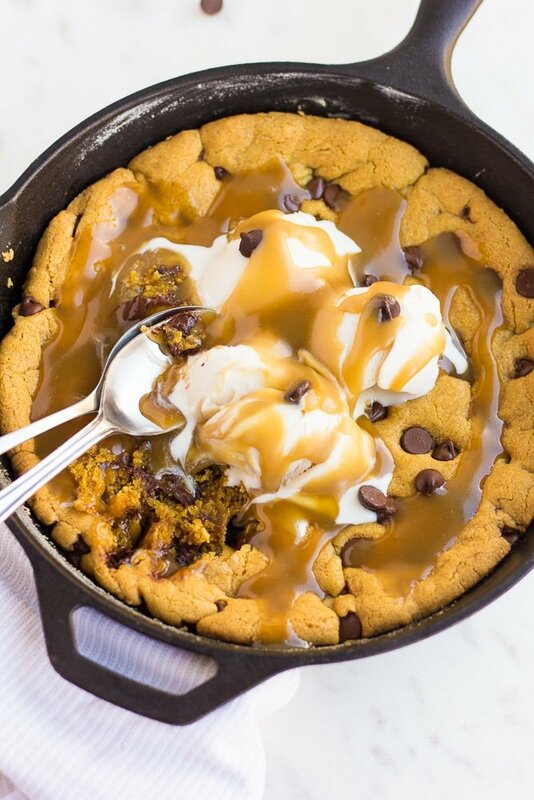 You can also leave out the caramel sauce for a regular chocolate chip skillet cookie, if you'd like. Make sure to use vegan chocolate chips, as many brands have milk added. 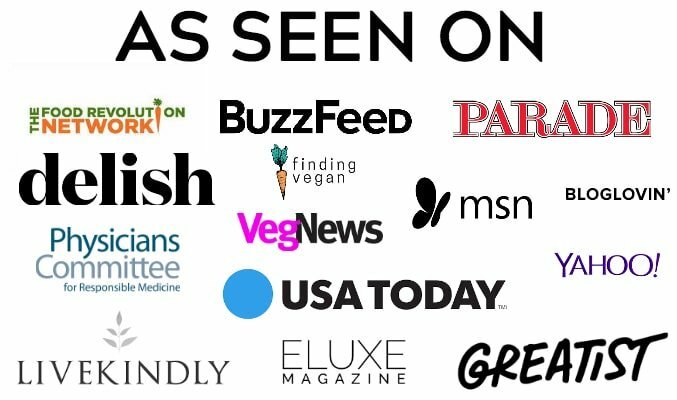 Check the ingredient list to ensure vegan friendliness. 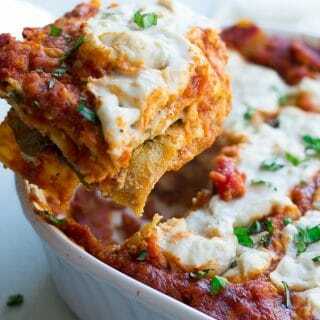 If you don't have a cast iron pan, you can still make this. Melt the vegan butter/oil in a large bowl, then add the brown sugar and mix. Add the milk/vanilla and mix. Then stir in the dry ingredients and chocolate chips. Transfer to a round 9 inch pan (greased) and bake for 15-20 minutes. 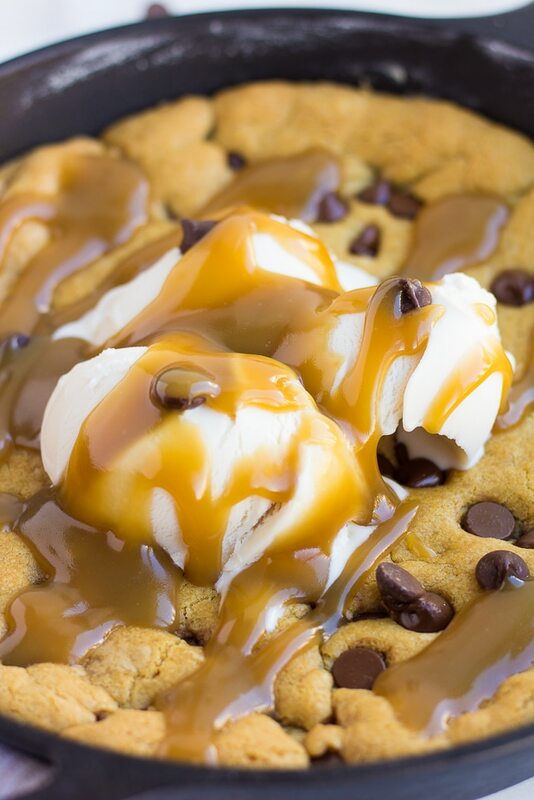 Calories estimate is for 1/8th of the cookie only, not with added ice cream and caramel.